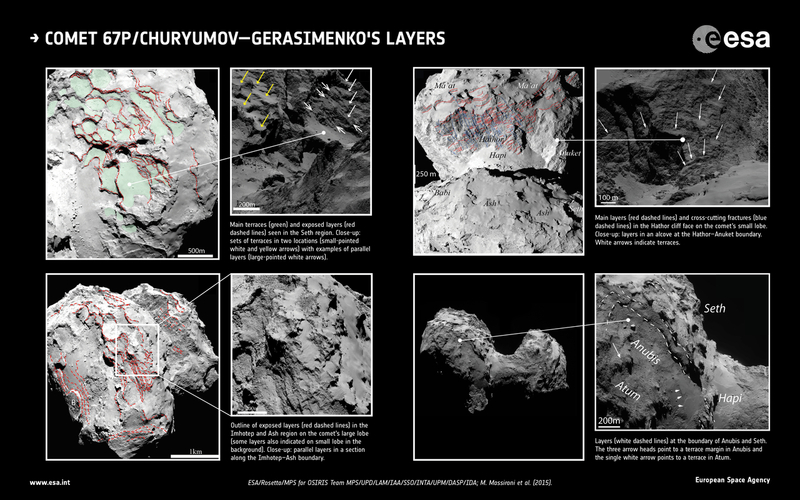 A selection of high-resolution OSIRIS images used to identify patterns in comet 67P/Churyumov-Gerasimenko's extensive layering. Top left: main terraces (green) and exposed layers (red dashed lines) seen in the Seth region on the comet's large lobe. The terraces become more inclined towards the comet neck region. The close-up shows terraces in two locations (thin white and yellow arrows) together with examples of parallel lineaments (large white arrows) that define a continuous stratification. Bottom left: outline of exposed layers (red dashed lines) primarily in the Imhotep and Ash region on the comet's large lobe. The terraces in Ash change their dip direction from that in Seth to very slightly dip towards Imhotep. Some layers are also indicated on the comet's small lobe in the background. The close-up shows the details of the parallel layers in a section along the Imhotep-Ash boundary. Top right: main layers (red dashed lines) and cross-cutting fractures (blue dashed lines) in the Hathor cliff face on the comet's small lobe. No abrupt change in the orientation of the layers is seen between Hathor and Ma'at. The close-up shows stratification in an alcove at the Hathor-Anuket boundary, providing a view of the Anuket inner structure, which appears to extend under Ma'at. Terraces on Anuket (white arrows) are seen in different orientations to neighbouring regions. Taken together, this reinforces the idea that Hathor represents the inner comet structure that has been exposed, with Anuket as the remnant. Bottom right: layers (white dashed lines) at the boundary of Anubis and Seth on the comet's large lobe. This continuous scarp suggests the thickness of the Seth region is about 150 m. The three arrow heads point to a terrace margin in Anubis and the single white arrow points to a terrace in the adjacent Atum region.